Packaging - Lazaridis Lazaridis/Filo Delicates needed a re-design of ther packaginges. 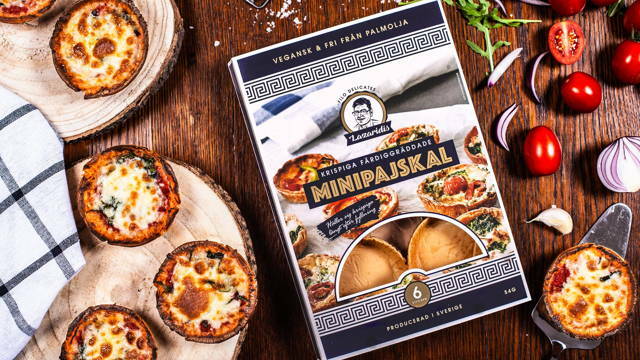 The products "Minipajskal" (mini pie shells) and "Filokrustader" (filo croustade) is first out to be re-branded. We chose to highlight the heritage of the product and make this the main focus for the packaging. The Filo pastry is a vegan product that the creator Mr Lazaridis brought with him from his town in Thessaloniki, Greece. Our choice for the design was therefore quite simple, highlight the Greek heritage.